I bet you are wondering exactly what a Smart Planter is and why you'd want it over any other planter? I wondered that too when I first heard about it and couldn't wait to get mine to find out. First off the Smart Planter is a very elegant looking planter. It has a nice bright glossy color to it and looks great in your kitchen window. 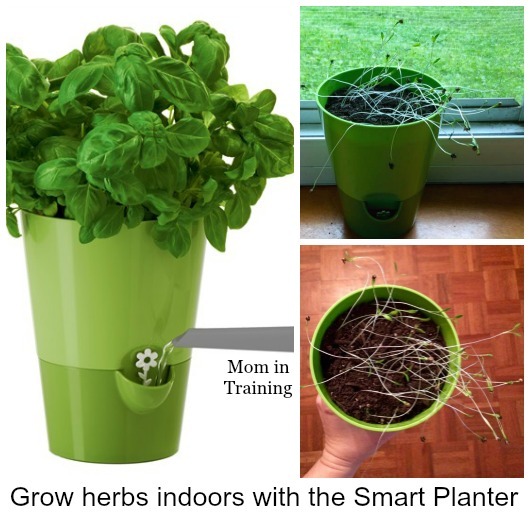 Second it's a simplified way to grow your herbs indoors and not have to worry about remembering to water them..this is where the "Smart" part comes in. One of the awesome parts that really excited me about the Smart Planter was that it tells you when you need to add water. NO more testing the soil to see if it's dry, or wondering when the last time was the plant got watered. With the Smart Planter it tells you exactly when you need to add water by the little pop-up flower that drops down when water needs added. I planted some herbs in my planter and it really didn't take long before little sprouts started popping up. It's actually pretty cool and it looks great in my kitchen window. I can't wait until the herbs are ready and I can start using them for cooking too. Buy it: You can purchase the Smart Planter on the Frieling website. I always wanted an easy way to grow Herbs and I never knew that it could be so simple with the Smart Planter. I will have to get a few to grow herbs in the house! I should really try this in the winter time! I live in a small apartment and have been wanting to grow my own herbs for a while now and this is exactly what I've been looking for! Thank you for sharing this information. Have you ever grow vegetables indoor? If yes, then what is your experience ?